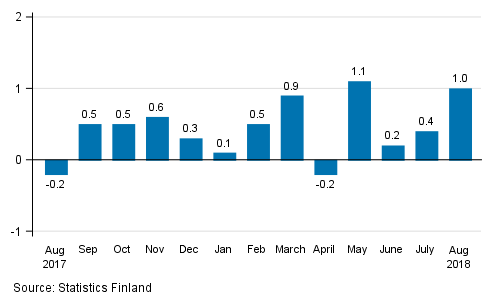 According to Statistics Finland's preliminary data, the seasonally adjusted turnover of large enterprises grew by 1.0 per cent in August 2018 compared with July. In July, seasonally adjusted turnover grew by 0.4 per cent, while in June, turnover was 0.2 per cent higher than in the month before. The unadjusted turnover of large enterprises grew by 7.1 per cent in August 2018 compared with August 2017. The turnover of large enterprises grew by 5.2 per cent in January to August from one year ago. ISSN=2342-0723. August 2018. 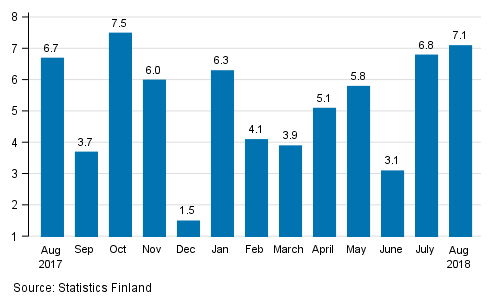 Helsinki: Statistics Finland [referred: 22.4.2019].